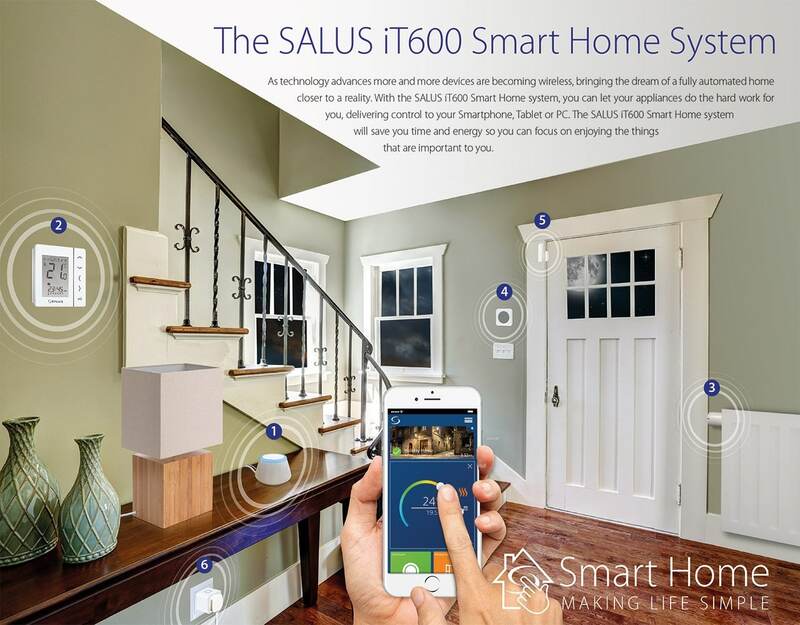 The UG600 Connection Gateway is the heart of a SALUS Smart Home system that allows the user to connect devices so that they link up and interact with oneanother. The Connection Gateway connects to the home WiFi and then allows the SALUS family of Smart Home devices to in turn connect to the Gateway. Unlike some connected home systems, the Gateway is the only device that needs to be connected to the internet meaning that setup is quick and it is simple to manage and grow the Smart Home system with more devices as required. The VS20WRF thermostat may be used for controlling a heating zone with up to 6 TRV’s per thermostat. It can also be connected to both door / window sensors and smart plugs. All units are wirelessly connected and it is possible to set up management for both time and temperature. You can set up Min / Max temperatures for each room and has the option to turn off the display on the thermostat to save battery life. The TRV10RFM Smart Radiator Control is the latest innovation from SALUS that allows you to precisely control your radiator room heating to the exact temperature and from anywhere. The SB600 Smart Button is a simple device that connects wirelessly with the Connection Gateway to integrate as part of the Smart Home system. It allows the user to activate pre-programmed complex Smart Home rules without the need for an app. The OS600 Smart Home Window/Door Sensor is a simple device that connects wirelessly with the Connection Gateway to integrate as part of the Smart Home system. By acknowledging when doors and windows have been opened or closed, Smart rules can be triggered to control other devices to save energy or create convenient applications. The SP600 Smart Plug is a simple device that plugs into a traditional socket and allows powering the socket on and off to be controllable and ‘Smart’.